This is Ginevra and she drinks too much gin. Her sleepy eyes are a sure sign of an incurable drunk! She’s my long lost beauty white, old skin modified F05 that we picked up over the holidays. Much love and gratitude to Mr. Kallisti for the modifications on the eyelids. He did an amazing job, and it was a lot of work. This is what she originally looked like. I ordered a truck load of blonde and white wigs for her, BUT THEY ARE NOT HERE YET. So she’ll be premiering this dress again when her wigs arrive, dammint. 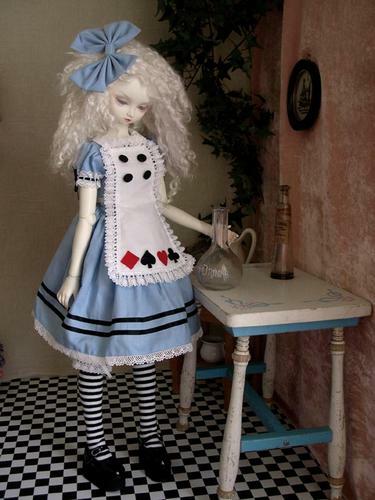 This is the famed Alice dress by Mijutanyu. I love it too much. I’d been waiting to try it on until Gin was finished, but she still needs the right wig. I love her. I had to paint her twice, the first time she came out lookin’ like a drag queen. And a week and a half went by before I had the time to do her again. Meh. On another note. I want to purge. I want to go through my house from one end to the other AND THROW EVERYTHING AWAY. Keep the real treasures and get rid of the crap. I think mass purging and a garage sale are in order. Stay tuned for more selling, but probably of the non-sd nature. Quality instead of quantity. That should be my mantra. She’s beautiful! Reminds me of my own DOD Tender Bee-a that has the same type of sleepy eyes. Such an amazingly beautiful doll. I love seeing all your dolly pictures. Ginevra’s makeup is so delicate! You should make her a tiny little opium pipe to further indulge her vices.